Say goodbye to paper order forms, carbon copies, faxes and phone calls with the Handshake order writing interface on iPad and iPhone. Have limited time with your buyer but need to maximize sales? No problem. Order entry on Handshake is optimized for speed and designed with the wholesale selling process in mind. You can quickly and conveniently showcase your catalog with compelling images and descriptions, easily add and remove items to your cart, and send order confirmation emails to your customers all with a few simple taps and clicks. Simply pull up a customer from your customer list on the app to start a new order. 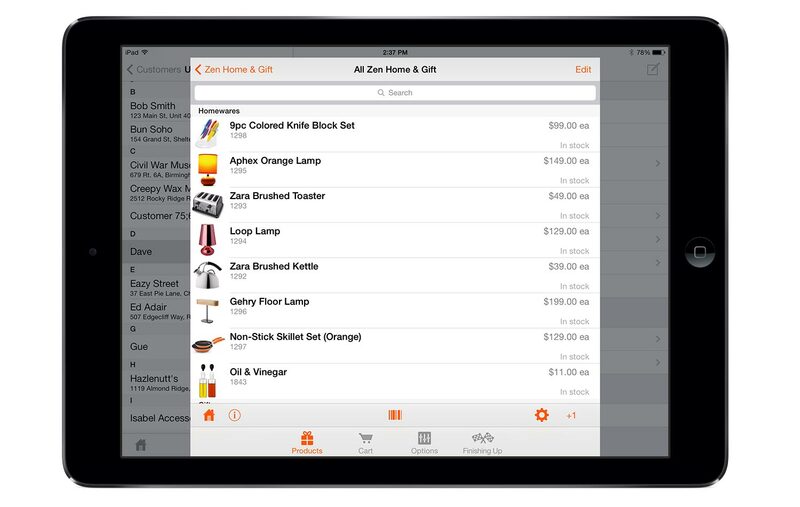 Next, browse your product catalog or search for an item to add products to your order. Prefer adding items to your order using a barcode scanner? We’ve got that covered too. Before confirming your order, you’ll have the chance to apply discounts, set up or modify order options like shipping addresses and preferences, payment information, and custom notes and photos. Once you’ve completed your order, you can send your customer an order confirmation email branded with your company logo. The order will also sync automatically to the Handshake website so your your back office can move the order into processing and fulfillment. This makes for more accurate orders, dramatically reduced fulfillment times and happier customers!